The first time I laid eyes on my son Calvin he was twenty-one hours old. He was sleeping in his isolette in the Neonatal Intensive Care Unit (NICU). His cherub face glowed round and flat like the moon atop his perfect little alabaster body. He had been born six weeks prematurely. 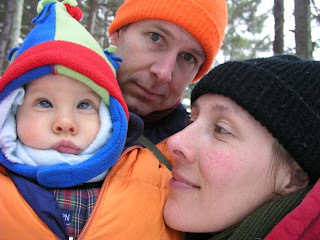 During a fetal sonogram two weeks before he was born, my husband and I had learned that his brain was missing a significant amount of white matter. 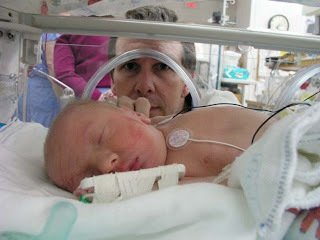 Now he was hooked up to an IV, C-PAP, and every kind of monitor amidst a cacophony of NICU alarms, buzzes, and bells. When Calvin heard my voice, he opened his deep indigo eyes for the first time and tears of joy, trepidation, and exhaustion filled my eyes. At four months, Calvin began all types of therapy to facilitate his extraordinarily slow development. Cerebral palsy compromised his strength and coordination. We spent our days and weeks visiting a myriad of specialists for his various health issues. Though grief-stricken and despondent with our situation, we were still falling in love with our little boy. By the time Calvin turned two he still could not crawl, walk, or speak. He had just learned how to chew and was beginning to feed himself Cheetos, grapes, and graham crackers. Music delighted him, funny sounds made him giggle, he relished being tickled, and had begun to engage happily with his world. And despite the fact that our dreams of what parenthood could be had been crushed, and while caring for Calvin was physically and emotionally strenuous, we still felt lucky to have this little imp in our lives. But then we met with a savage monster that eclipsed all other adversity we had yet encountered. That monster was, and continues to be, epilepsy. Calvin's first seizure was a grand mal seizure. He had a fever and was resting peacefully with us when suddenly he seemed to choke. His body stiffened and he turned ashen-grey, then blue, and with eyes bulging, he began to convulse. Without delay, I called 911 and four minutes later when the paramedics arrived he had begun to come out of it. He was taken by ambulance to the emergency room. That was the first of innumerable visits there. Even with strong medication, Calvin continued to suffer seizures that came in large clusters and at times developed into status epilepticus, a prolonged seizure that can often lead to death. More than half a dozen times that first year ambulances transported him to the Pediatric Intensive Care Unit (PICU). Much to everyone's distress, Calvin's seizures frequently caused, and still cause, him to stop breathing and required him to be emergency intubated. Once, to our horror, we witnessed him being intubated without anesthesia. And worst of all, during one forty-five minute seizure when he did not respond to a bevy of emergency medication; we were left helpless at his side, terrified for his life and powerless to do anything to help him. Calvin has had to endure being restrained while being poked and prodded by countless needles. He has had to cope for days with scores of EEG leads glued to his head and he has suffered the scourge of eight anticonvulsant drugs. For over two years now and without interruption he has endured two rigorous, highly restrictive diets. None of this he understands. Notwithstanding these treatments, his seizures show no signs of stopping. The medicines cause horrible side effects such as headaches, dizziness, visual disturbances, poor balance and coordination, sleep disruption, poor appetite, low muscle tone, nausea, fatigue, weakness, lethargy, somnolence, cognitive blunting and memory loss, many of which Calvin already suffers as a result of his neurological condition. The drugs can also have lethal side effects leaving us to wonder if the treatment might be causing as much damage and risk as the disease. Sadly, Calvin cannot tell us what is hurting. The monster continues to pummel our little boy. It haunts us day and night. It has stifled his development and there seems to be no end in sight to this nightmare. The only hope, after years of trying to subdue this monster, is a cure. But Calvin, our little peanut, is such a trooper. After each attack, he has bounced back, at least part way. His resilience and tenacity are formidable. I imagine Calvin's spirit to be bigger than this monster. Despite this battle he wages, Calvin has enriched our lives beyond explanation. He has taught us to delight in simple things, to have patience, to take nothing for granted. And if this monster ever takes our boy away from us, we will still be left with the memory of his sparkling eyes, his infectious smile, his hearty giggle, and his sweet hugs and kisses on the nose. It is because of Calvin that we persevere in the same way that he does. Calvin is my hero, my little muse, my inspiration, and the one who makes me want to be a better person every day.